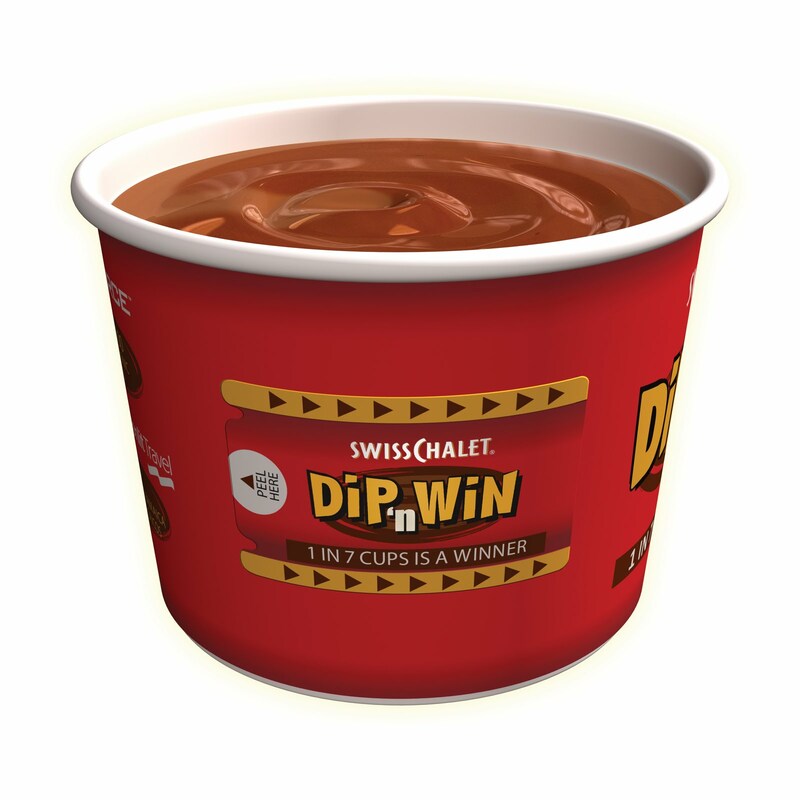 Swiss Chalet's Dip 'n Win is Back Plus a Giveaway! One of my favourite places to eat out is Swiss Chalet. I love chicken but I think what makes Swiss Chalet so tasty is the dipping sauce. I can't have Swiss Chalet without it, it just isn't right. I am one of those french fries and chicken dippers just because it is so good. What kind of dipper are you? Canadians were asked if they dip, drench, pour or sip? The survey found that most Canadians enjoy dipping their chicken in the Chalet Sauce as opposed to pouring it over fries, using it to make side roll sandwiches or drinking it right from the cup (people do that?). Did you know in a recent survey, 65% of Canadian's love Swiss Chalet Sauce? Canadians were also asked if they'd give up their cell phone, morning coffee or an hour of sleep to get dippin' in unlimited Swiss Chalet Sauce for a year. Most were willing to give up their morning cup of java! Dip 'n Win is back at Swiss Chalet which began May 25th, 2011. If you haven't played before now is the time to learn! Just head into Swiss Chalet and order any entree accompanied by Swiss Chalet's famous Chalet Sauce (while supplies last), including Family Paks in the Dining Room, or through Take Out, Deliver and Drive Thru then peel to reveal great prizes. Prizes this year include 30 vacations, five cars, five cash prizes of $10,000, various electronics and free Swiss Chalet menu items, including one grand prize combo of Swiss Chalet for life and a luxury automobile (approximate value $100,000). The chances are really great also 1 in 7 Chalet Sauce Cups is a winner! Some fun Swiss Chalet facts. Did you know Swiss Chalet has been perfecting it Chalet Sauce for 57 years since its creation in 1954? Swiss Chalet's Chalet Sauce is made fresh every day on premise. Each Swiss Chalet restaurant has perfected the art of determining when the famous Sauce has reached the perfect texture and quality and this is done by the eye! Mandatory Entry: Please visit Swiss Chalet. Come back and leave a comment telling me what your favourite side dish is. Don't forget to leave your email address in case you win! Extra Entries: Each one is worth one entry each (one comment is an entry) unless otherwise marked. This giveaway is open to Canadians only and ends on June 22nd,2011 at 12pm EST. I will use Random.org to choose two winners each will receive a $25 gift card to Swiss Chalet. The winner will have 48 hours to respond with their information. Thanks and Good Luck!! My favourite side dish is for sure the french fries and sauce. That is the reason my family loves going to Swiss Chalet. My favorite side is the fresh-cut fries. the garlic cheese loaf is great ! My favorite side is poutine! fries and chalet sauce yum!! I love their fresh cut fries! My favorite side is their fries absolutely yummy! Their fries are fantastic! yumm! My favourite side dish is definitely poutine! The side dish I'd love to try the the poutine! And the creamy coleslaw. Following Canadian Coupon Mom on Twitter as @mommygiveaways. Following Swiss Chalet on Twitter as @mommygiveaways. My favorite side dish is the rice, omg it is so delicious!!!! I like the chicken spring rolls!